electro-music.com :: View topic - Sync pulse from LED? Posted: Sat Feb 03, 2018 3:49 pm Post subject: Sync pulse from LED? Subject description: Can I hack a tap tempo button to provide sync in/out? I'm curious to know if there's a way to get Korg-style sync I/O via the tap tempo button and LED on my Akai MPK Mini MkII. That way the arpeggiator could potentially transmit sync or slave to external gear. Thanks. Cool, thanks. I just got a bunch of LDRs to make that $3 low pass gate. I'll try working something up. Here's what I was thinking. It's based on Synth DIY Guy's low pass gate from this video https://www.youtube.com/watch?v=8BOnvSQpoGY. Can I simply tap the MPK's LED as shown? TIA! I'd probably put the LED in series but this is easier to do and might even work better. It depends on the MK circuit that's driving the LED. It could also be that the LED has a higher voltage drop than the one you are adding in which case it might not light up anymore. circuit you've drawn that's probably not necessary. (depending on LDR resistance). Just try it and see how it works for you. As is, the circuit will not work as there is nothing to discharge the 10 µF capacitor (except maybe for an externally connected resistor on the output, but that would give ill defined behaviour), so once it is fully loaded nothing further will happen. So at the very least it will need some load. Apart from that 10 µF seems a bit large with the resistance range an LDR can have. But anyway, I'd follow PHOBoS' suggestion. Is this along the lines of what was described above? 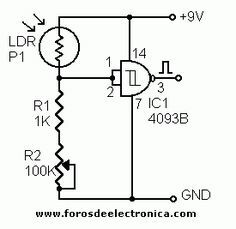 yes, but swap the positions of the LDR and R1+R2 otherwise the output pulse will be inverted compared to the LED.